Jimmie Martin – a new supporter on board. Beautiful individual Rhino Art. A 20% donation is made to the charity for each piece purchased. Please quote PR/10014. See poached rhino facebook page or go to www.Jimmiemartin.com. 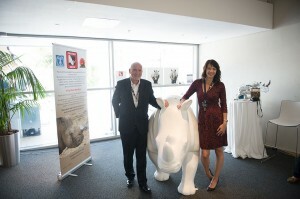 We are looking to have a number commissioned with Poached rhino logo and other designs. Please email if interested. Forever Gems – in Franschhoek, will be our first retail outlet to complement our up and coming online shop. Dan Butler from db@fluidcreative.com who has helped poachedrhino.org with the web site, emails and all the “technical stuff” that a charity needs so one can concentrate on all the other key activities such as raisng awareness and organizing donations. A roaring success! That’s the verdict of both the organisers and attendees of the ‘Wild in Africa Rhino Ball’ that took place in aid of the Poached Rhino charity in Franschhoek in February 2015,2016, 2017 and 2018 – raising more than R1.2 million net profit. Craig At ROCA , Dieu Donne Vineyards for making the Rhino Ball part II such a huge success.